LIVE Kickoff webinar! Distance education in a blended learning format: Earn 13.0 CE contact hours in this series which focuses on 2019 CHAP Hospice Standards effective October 1, 2019. Four (4) part webinar series featuring data and lessons learned from Q1 - Q4 2018 of the new CoPs. Join CHAP as we call upon experts to address key areas of quality in hospice-namely the role of the Medical Director, effective education for the hospice team, using outcome data effectively to benefit your organization and the most commonly cited hospice deficiencies and solutions. 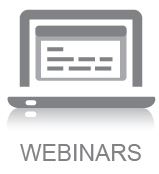 Earn up to 6.0 contact hours for this webinar series.